You either love her or you hate her but no one can deny Ronda Rousey’s influence on the world of mixed martial arts. Since making her amateur debut in 2010, the Olympic bronze medallist in Judo has reshaped the sport and emerged as a pop cultural icon, leaving an imprint which will be preserved well beyond her career in the Octagon. A fighter, a trashtalker, an actor, a pioneer, the list of labels attached to Rousey are as long as her accolades. But few are as poignant and as significant as ‘role model’. Rousey has been a champion for women across the globe, teaching them the value of what they can achieve with their bodies, rather than how it looks to others. In a ruthless sport dominated by men, ‘Rowdy’ blazed a trail by becoming the first woman to sign with the UFC back in 2012. Three months after that she became the first female fighter to headline a UFC event before going on to clear out the bantamweight division with six straight title defences. The baddest woman on the planet was the best thing for the sport as her influence extended well beyond the canvas. Rousey gets regular modelling work with her memorable appearances on Sports Illustrated’s Swimsuit Body Issue and has been a success in Hollywood, landing roles in The Expendables 3, Fast & Furious 7 and the Entourage film. 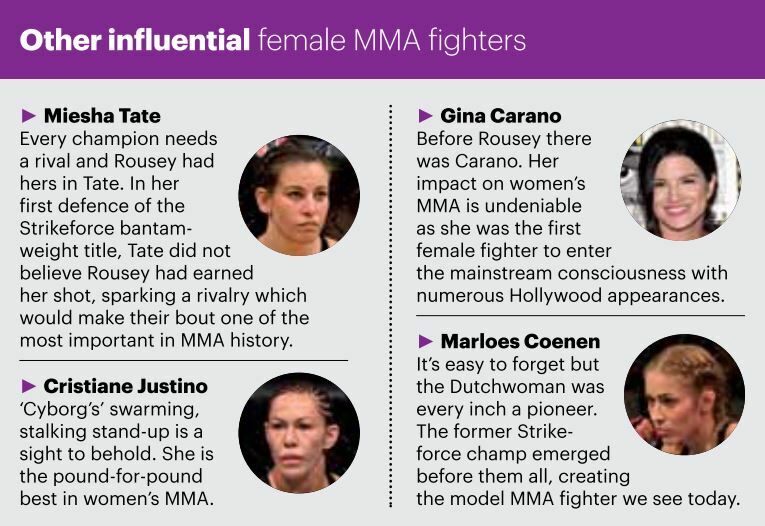 Her level of fame reached its zenith when she was included in the Top 100 Most Influential People in Time earlier this year – that coming despite the earth-shattering defeat to Holly Holm last November. Rousey can legitimately be considered alongside the likes of Serena Williams as the most influential female athlete on the planet. It is for that reason her return to the Octagon against the current 135lbs champion Amanda Nunes at UFC 207 in December, is not just welcome sight but a necessity. 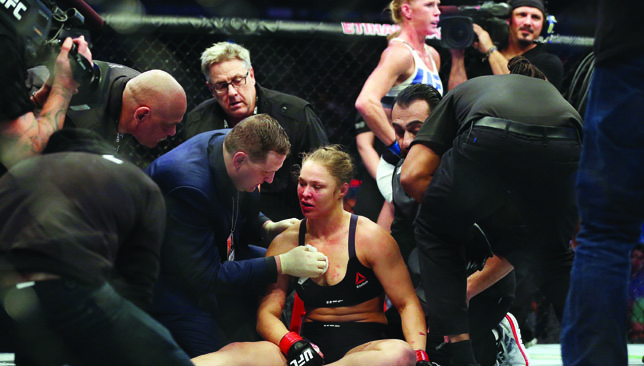 Yes, Rousey could have so easily walked away from the sport and few would have blamed her. After all, she would be leaving women’s MMA in a far more prosperous position than when she entered it, with divisions now talent-rich and female fighters regularly headlining the UFC’s biggest events. No one feels robbed of their dollars when a woman tops the bill because everyone recognises their talent and skill. Few other sports boast that type of equality for female athletes, both in recognition and in pay. The 29-year-old has done more than enough for this sport but ending her career after suffering the first defeat of her career – and given the nature of it – would have belied her responsibility to those who idolise her. Whether she wins or loses in December is of little importance in the wider context because the fact that she got back up after defeat speaks far more volume. Make no mistake, a Rousey victory is good for the sport as her shadow has lingered over the division ever since she slipped out of the light. But perhaps featherweight champion and fellow pay-per-view draw Conor McGregor said it best when he return was announced this week. “I’d tell her to go shut them all up now,” the Irishman told Sports Illustrated. “Shut them all up. Go and stake your claim again. “I wish Ronda nothing but the best, it’s good to see her back. Some people take defeat and losses a certain way. You see how some fighters take losses. The 2005 epic between Forrest Griffin and Stephan Bonnar is widely recognised as the most famous UFC battle of all time. On the night, each of the three judges scored the fight as 29-28 in favor of the winner, Griffin, but White granted Bonnar a UFC contract there and then following his impressive showing. What is your best memory of the fight? Forrest Griffin and Matt Parrino break down the new rankings. Gegard Mousasi and Jimi Manuwa both move up and take the No. 5 spot in the middleweight and light heavyweight division, respectively. Also, the guys talk Michael Bisping and Dan Henderson. What do you make of the new rankings and this week’s biggest movers and shakers?